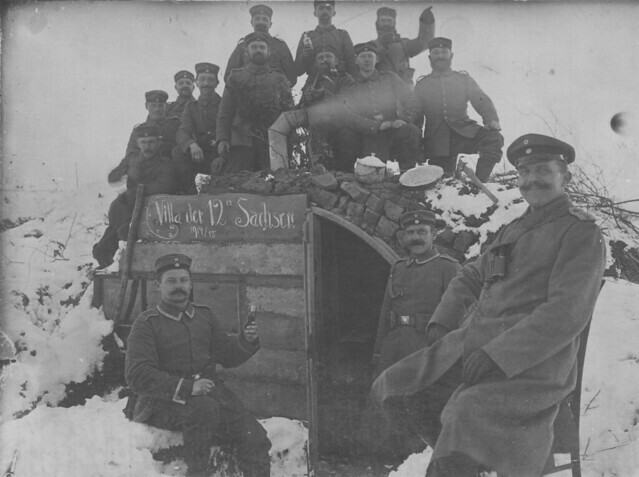 This German image shows an officer and men from the ’12 Sachsen’ in a snow covered dugout in Northern France during the winter of 1914/15. This unit was in fact the Königlich Sächsisches Feldartillerie-Regiment Nr. 12, part of the German 23rd Division. It had fought in Belgium in 1914 and also in the Battle of the Marne and then had been in action on the Aisne. During the winter of 1914/15 it was north-west of Reims, where this photo was taken. Equipped with 77mm Field Guns, the regiment was based some way from the front line as this type of dugout even in the early period of the war would have been quite a target directly on the battlefield. In 1915 the regiment would go on to fight in the Champagne and later in 1916 on the Somme. This entry was posted on 05/12/2012 by sommecourt. It was filed under Battlefields, Flanders, France, German Army, Germany, Great War, Western Front, WW1 and was tagged with Artillery, France, German Army, Saxony, Western Front, Winter, Winter War, WW1. Saxon Villa – very nice.